The AS version provides a 2:1 "Asymmetrical Power Distribution", 66% on head A and 33% for head B. The power range covers 8.5 f-stops from 1100 Ws to 8.5 Ws. The output B offers an action freezing flash duration of only 1/5120 s at t 0.5. The Ranger RX Speed AS recycles super fast in only 3 s to full power. A fully charged battery delivers approximately 5100 flashes at low power setting and up to 250 at full power. Travel lite with only 8 kg. The Ranger RX, RX Speed and RX Speed AS units are designated RX because they may be operated by Hand Remote Control or by Mac and PC computer to increase the ease of use on location. Why Ranger RX Speed AS & Ranger RX ? Consistent flash power at any battery level. Charger, Multi-voltage with European, USA and UK adapters. Battery re-charging - to full power- 3 hours. The charger can charge the battery in the unit or externally. Charge Ready Light / Open Flash, indicated with bright LED! Battery Charge Indicator, two green LED 100%, one green LED 50%, one red LED approx. 10%. 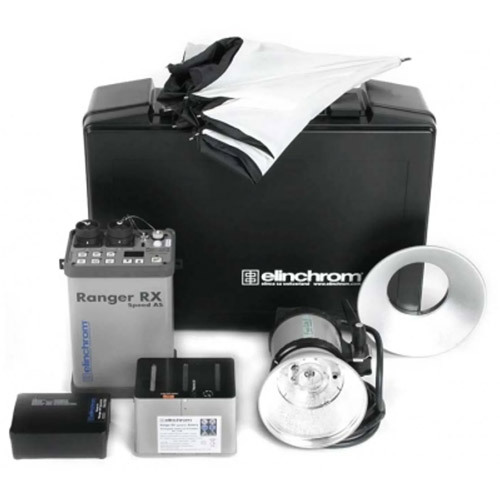 The Ranger electronic protects the battery from over and complete discharging. The battery can be recharged at any level. There is no “Memory-Effect”! Battery-Box Quick Release, to release, press the two push buttons at the left and right side of the housing, lift up the unit releasing the existing battery - then place the pack over the replacement battery, pressing firmly down for automatic locking. Raised sockets complete with covers; electronics only in the upper part of the unit. Free Lite A head; 50 Halogen modelling lamp, 3 m cable. For optional RX Hand Remote Control / all models. To connecto to computers with MAC/Windows operating systems / all models.